Celery is one of the most popular vegetables around today. With the average adult consuming nearly six pounds every year, it’s no wonder we are seeing a better appreciating for healthy eating. Celery’s closest ancestor was first farmed in the Mediterranean over three thousand years ago, and was not only used for culinary purposes, but for medicinal purposes in ancient Egypt. Over the years, the United States has become a major producer and consumer of celery, with billions of pounds of celery produced every single year. Celery, while maybe one of the most hated vegetables by children around the world, is a fantastic addition to one’s diet for a variety of different reasons. Celery contains phthalides, which is a phytochemical that helps the artery walls relax, thereby letting the blood flow through the vessels easier, lowering blood pressure. (2) It is suggested to consume at least a cup of celery per day to see the blood pressure benefits. Though celery alone is not meant to be a replacement for prescriptions medicines, it may contribute towards long-term treatment when utilized correctly. Always consult with your doctor to ensure that any changes to your treatment plan will not be detrimental. High cholesterol, like high blood pressure, is a problem that is common for many adults in the United States, with approximately one in eight people suffering from this condition. Left untreated, high ‘bad’ cholesterol, or LDL, plays a major role in the development of heart disease, which in turn can lead to heart attack and stroke. Celery is high in a number of different beneficial nutrients, but most importantly for lowering high cholesterol is potassium. (3) Potassium intake in the United States is generally lower than what is recommended by the World Health Organization. A 100 gram serving (approximately 1 cup) of celery contains 260 mg of potassium and at only 16 calories, is an excellent weight loss food as well. Inflammation is an important part of the body’s immune system, as it protects a wound or infection site from further foreign bodies and helps the body to heal. Unfortunately, too much inflammation can be a bad thing, and can be the cause of many chronic illnesses, such as asthma, inflammatory bowel disease and stomach ulcers, and rheumatoid arthritis. Additionally, celery’s flavonoids and other antioxidants can help to fight ulcers by reinforcing the stomach lining. In this same way, celery can help to protect the stomach from gastritis, which is the inflammation of the stomach lining, which leads to heartburn, indigestion, and nausea. Cancer affects nearly two million people in the United States every single year. There are dozens of different kinds of cancers, all caused by a variety of different environmental compounds and DNA abnormalities. As those who have been diagnosed with cancer know, the treatments options can be incredibly harsh and exhausting on the body. Similar to the role they play to help lower inflammation, flavonoids in celery help to lower the risk of cancer. Flavonoids are antioxidants, which are incredibly important agents in the body that work to eliminate free radicals. Free radicals are unstable molecules that latch on to other molecules and can cause a host of different problems, most notably cancerous cells. Flavonoids prevent cancer cells from spreading and kill the original cell. Celery is full of various flavonoids that work throughout the body to lower unnecessary inflammation, relieving pain and symptoms of chronic diseases. (4) These flavonoids called luteolin and apigenin have been proven to kill human pancreatic cancer cells because they act as antioxidants. It would be difficult to eat enough flavonoid-rich foods to raise blood plasma levels high enough to beat cancer cells, but the implications are notable. Urinary tract infections are incredibly painful yet common infection that can cause further complications in the kidneys when left untreated for too long. Women are particularly susceptible to these infections and many reach for cranberry juice when faced with the familiar burning and frequent urge to visit the bathroom. Generally caused by E.coli, celery works great as an anti-bacterial agent to keep bacteria out of the urinary tract. 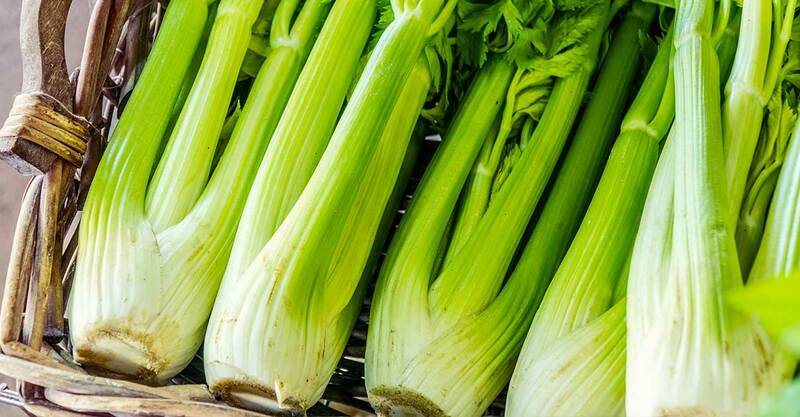 Celery’s anti-inflammatory antioxidants also help to aid in pain relief. Additionally, celery can help lower the production of uric acid in the tract, lessening the pain associated with UTIs. It may even serve as a natural diuretic to help flush out bacteria in your system. Fiber is an incredibly important, but most people barely hit the recommended 25 to 35 grams if dietary fiber per day. Celery, with its high water content is rich in fiber as well. Fiber is not digested as quickly or as easily as simple sugars for example, but it is essential for gut health and regularity. It serves as nature’s broom, adding bulk to stool and ensuring that the intestines are clear of debris. It should be noted that extra fiber can increase gas and can cause dehydration if not taken with enough water. The liver is an incredibly important organ in the body because it is responsible for filtering out toxins. People who don’t consume enough fruits and vegetables or whole foods in general, should be doubly vigilant about monitoring liver health because it is the body’s first line of defense from unhealthy substances. (5) Celery helps to remove the buildup of toxins from the liver due to the high amounts of antioxidants as well as other vital nutrients such as vitamin K, folate, vitamin A, vitamin C, calcium and vitamin b6. For those with fatty liver disease caused by excessive alcohol consumption, diabetes or poor nutrition, making a lifestyle change is imperative otherwise you run the risk of developing heart disease, hypertension, cancer, and liver cirrhosis. Consuming micronutrient-rich foods such as spinach, kale and celery are great for this. In the United States alone, two thirds of adults are categorized as either overweight or obese which can cause a host of different health concerns, including high blood pressure, heart disease, diabetes, and fatty liver disease. However, it can be incredibly difficult to lose weight and keep it off permanently. One of the best ways to do so is to consume plenty of water and to observe a balanced diet that is rich in fiber, low in sugar, and with moderate healthy fats and protein. Celery is high in fiber, low in calories, and has high water content, making it a great food to incorporate into your diet when you are attempting to lose weight. It is also a food that pairs well many other flavors, as its high water content and neutral flavor make it easy to incorporate into various cuisines. (6) It also retains many nutritional benefits even after it has been cooked, a feat that is not commonly shared with other vegetables. Celery is a lesser-known remedy for bloating and water retention. For women, bloating can be extremely uncomfortable especially in the days leading up to the menstrual cycle. Consuming celery may alleviate certain pre-menstrual symptoms such as water retention and bloating in the abdomen, relieving pressure and fullness related to unpassable gas. Celery may also be used as an alternative to stomach bloating medication for those who prefer natural digestive aids. For those who are on special dietary restrictions particularly low-sodium diets, you will be happy to know that celery is considered safe to eat and contains only 30 mg of sodium per serving. It also packs a lot of flavor in a small package, so you don’t need to use much to flavor your food. Simply add a couple of stalks to your vegetable broth and you will have a flavorful soup without the boatloads of sodium that usually accompany boxed soups and mixes. Celery is a fantastic vegetable to add to your diet, whether your are trying to lose weight or just live a healthy lifestyle. It has a variety of different benefits for overall health, and with high levels of antioxidants, low calories, and no fat, cholesterol, or sodium, it is a great vegetable to add to any dish.